The Australian Competition and Consumer Commission has released its annual Airport Monitoring Report for 2013-14. The report covers many dimensions of airport activity and reveals, for example, that only Brisbane airport delivered a ‘good’ quality of service, while Sydney Airport recorded the highest car parking margins. The ACCC has found that despite relatively low passenger growth, monitored airports have continued to report substantial increases in aeronautical revenues and margins. Growth in international passenger numbers, which attract higher aeronautical charges, contributed to the increases in margins in 2013-14. The ACCC reports annually on the performance of Brisbane, Melbourne (Tullamarine), Perth and Sydney (Kingsford Smith) airports. In last year’s report, the ACCC called for greater investment to adequately deal with current congestion, accommodate future passenger growth, and improve service levels. “Despite some significant investment, the monitored airports have continued to generate substantial revenue and profitability increases, yet we are not seeing any substantial increases in the overall average quality of service indicators at these airports,” ACCC Chairman Rod Sims said. Both Perth and Melbourne airports received the equal lowest quality of service rating of the airports during the year while Brisbane Airport was the only monitored airport to achieve a rating of ‘good’. Car parking continued to be a significant source of revenue for the airports during 2013‑14, and all airports increased their car parking revenue during the year. Each airport, apart from Melbourne Airport, increased their car parking margin. Sydney Airport earns the highest car parking margin of the monitored airports. Since the removal of price caps at monitored airports, the ACCC’s monitoring has found that airports have reported significant increases in real earnings, with some margin increases exceeding over 300 per cent in real terms over that decade. Each airport has, however, increased its aeronautical asset base in real terms since 2003‑04. These real percentage increases have ranged from 21.5 per cent at Sydney Airport to 206.5 per cent at Perth Airport. While acknowledging the lumpy nature of aeronautical investment, each airport also reported a larger level of capital expenditure as a proportion of aeronautical assets in 2013‑14 than in 2003‑04. The report also suggests that there is evidence that at some of the monitored airports that airlines do not possess enough bargaining power to ensure appropriate commercial outcomes. However, airlines may have some bargaining power through their ability to initiate an application to the National Competition Council for an airport to be declared under Part IIIA of the Competition and Consumer Act 2010. In the case of a declared airport, the ACCC would act as an arbitrator in a situation where negotiations between airports and airlines were unsuccessful. There have been only two applications by airlines to have airport services declared since the privatisation of the major airports, and only one process that commenced. “We do consider that the general provisions of Part IIIA provide a credible option for airlines and other airport users, however, there is considerable time and uncertainty involved in going through the declaration process,” Mr Sims said. A potential avenue to address these imbalances could include deemed declaration. This would require the Australian Government to amend the Airports Act 1996 to deem all aeronautical services as open to arbitration by the ACCC if commercial negotiations break down. Bargaining power imbalances are better addressed through competition, such as alternative choices to the monopoly airport operators. However, in the case of the second airport to be built in the Sydney region, competition was potentially removed when the Australian Government provided the acquirer of Sydney Airport with the right of first refusal to develop and operate any second airport within 100 kilometres of the Sydney CBD. “Unfortunately, in this case short term budgetary considerations have served to undermine the competitive framework that delivers improved services and lower prices within a market economy,” Mr Sims said. Further details of results of this year’s monitoring for each airport and statistical tables and charts are attached. The Australian Government has directed the ACCC to monitor the performance of the four largest airports until 2020. This report provides information on the airports’ price changes for services provided to airlines (aeronautical charges such as aircraft landing and parking charges) and to consumers (car parking charges), financial results, and indicators of quality of aeronautical services. The ACCC derives its quality of service information from subjective responses to surveys of passengers, airlines and landside operators (such as off‑airport car parking operators, buses and taxis), and from objective data from the monitored airports. The ‘overall average quality of service’ measure is calculated as an average of these ratings (excluding responses from landside operators). The ACCC’s monitoring role does not involve direct regulation of monitored airports or any power to intervene in the airports’ setting of terms and conditions of access to their infrastructure. Monitoring does not, of itself, prevent the airports from increasing prices or failing to increase the quality of services. The ACCC’s monitoring role for aeronautical services relates only to those terminals that are owned and operated by the airports. Some domestic terminals at the monitored airports are leased to and operated by domestic airlines and these terminals are not subject to the ACCC’s monitoring. All monitored airports reported an increase in aeronautical unit revenue and a deterioration in aeronautical quality of service outcomes from 2003-04 to 2013-14. Aeronautical revenue per passenger increased in real terms and average aeronautical quality of service ratings declined at all airports over the period. airlines’ ratings of the airport improved within the ‘satisfactory’ category. Brisbane Airport reported moderate growth in passengers during the year, and was the only airport to report a reduction in aeronautical operating margin per passenger. Brisbane Airport has consistently been the only airport to receive an overall average quality of service rating of ‘good’. Brisbane Airport’s major current project is the construction of its new parallel runway which is expected to be completed by 2020. 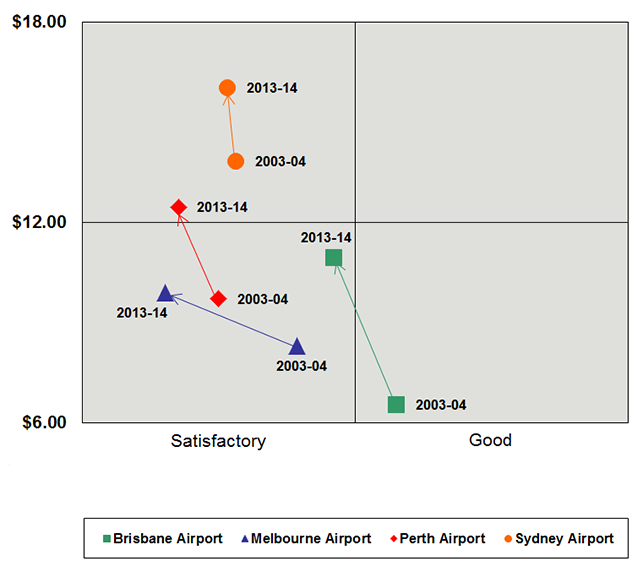 Brisbane Airport’s 2014 Master Plan was approved by the Minister for Infrastructure and Regional Development on 2 February 2015.
airlines’ ratings increased from ‘poor’ to ‘satisfactory’. Melbourne Airport reported the largest growth in passenger numbers in 2013‑14, driven by strong growth in international passengers. This passenger growth combined with some increases in landing charges, and decreases in operating expenses led to Melbourne Airport also reporting the largest growth in total aeronautical operating margin. Melbourne Airport was the only monitored airport to receive an average landside operator rating lower than ‘satisfactory’. Melbourne Airport’s major current project is the Southern Precinct Project, which includes the construction of a new domestic terminal to replace the existing Terminal 4 and a new ground transport hub. Melbourne Airport’s 2013 Master Plan was approved by the Minister for Infrastructure and Regional Development on 18 December 2013. Perth Airport reported the smallest growth in passenger numbers during 2013‑14, driven by a decline in domestic passengers. This is the first time over the monitored period that Perth Airport’s domestic passenger numbers have declined. Although Perth Airport had the smallest passenger growth, it reported the largest growth in total aeronautical revenue and the second largest increase in total aeronautical operating margin. Despite an increase in average airlines’ ratings, airlines continued to express concerns with the availability and standard of facilities within the international terminal. On 16 January 2015, the Minister for Infrastructure and Regional Development approved Perth Airport’s 2014 Master Plan. Investment plans in the master plan include the consolidation of all commercial air services into a single precinct and a proposed new runway. Sydney Airport reported moderate growth in both domestic and international passengers during the year, as well as moderate growth in aeronautical revenues and operating margins. Sydney Airport has consistently reported significantly higher aeronautical revenue and operating margin per passenger than the other airports. This was also the first year since 2006‑07 that Sydney Airport has earned the highest car parking operating margin of the airports. In February 2014, the Minister for Infrastructure and Regional Development approved Sydney Airport’s 2014 Master Plan. Investment plans include the re-configuration and expansion of its terminal infrastructure to create two integrated terminal precincts. all airports reported higher car parking revenues and most reported higher car parking margins (tables 5 and 6). Note: Comparisons across monitored airports must be treated with caution. Results can be affected by the airports’ different terminal configurations, passenger mix and the different approaches to valuing assets. Ratings for overall quality of service: 1 – very poor; 2 – poor; 3 – satisfactory; 4 – good; 5 – excellent. Note: Changes for financial data are presented in real terms (base year = 2013–14). Note: Brisbane, Perth and Sydney airports’ short-term and long-term car parking prices are based on prices at the domestic terminal car park at each airport. Melbourne Airport’s long-term car parking prices are at the long-term uncovered car park. (a) The ACCC notes that most monitored airports provide an online booking system for car parking in addition to the drive‑up rates. The online booking system usually offers a rate that is at a discount to the equivalent drive-up rate. While the usage of these online booking services has been increasing each year, an analysis based on drive up rates remains appropriate given that a large majority of airport users still choose to pay the drive-up rates when using airport car parks. The ACCC intends to assess the feasibility of collecting and reporting on online and average prices for airport car parking in future airport monitoring reports. (b) Sydney Airport opened a new car park at its domestic terminal during 2013-14 that offers a daily parking rate of $45. Note: (1) pp = percentage points (2) Changes for financial data are presented in real terms (base year = 2013–14).